Similar to the hidden fact that a new marriage should require the wife and husband to live together, I am convinced there is another hidden truth for adapting to life with a man. A cluttery, dish-dirtying, throw-my-wet-towel-on-the-bed boyish sort of man. But when will I learn it?! Before we were engaged, I heard many a person warn me that finances would be the thorniest issue about newlywed life. About married life. People are liars, that’s the hardest part about life in general. The worst part about newlywed life is keeping a clean apartment. Keeping this space tidy has caused many a passionate disagreement around here. It is enough to make me feel genuinely neurotic. Like I am recently uncovering a latent case of obsessive compulsive disorder and my darling new husband has no sympathy for this disease. Current fiancees, be forewarned. In my case, I simply thought a tidy workspace and constantly clean kitchen were signs of an organized and efficient person. Apparently, not everyone agrees. Oh the humanity! Get them out of there before something awful grows. The decreased size of our apartment has magnified the effect of the dirty dish. 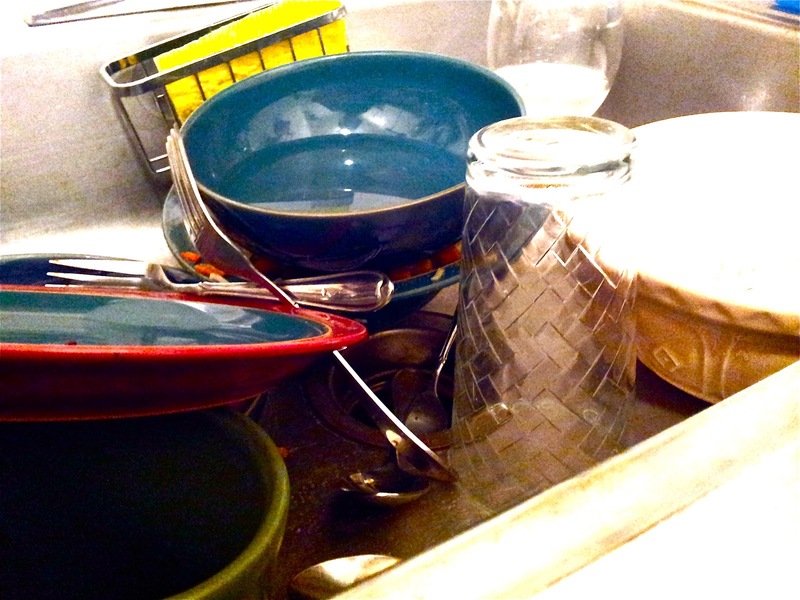 A pile of plates in the sink are a Pisa tower of soggy dinner filth, threatening to direct wafts of watery spaghetti sauce in the direction of my breakfast toast. How’s a girl to read the morning news with that thought tickling her peripheral vision? To make matters worse, I attempted to make them better. 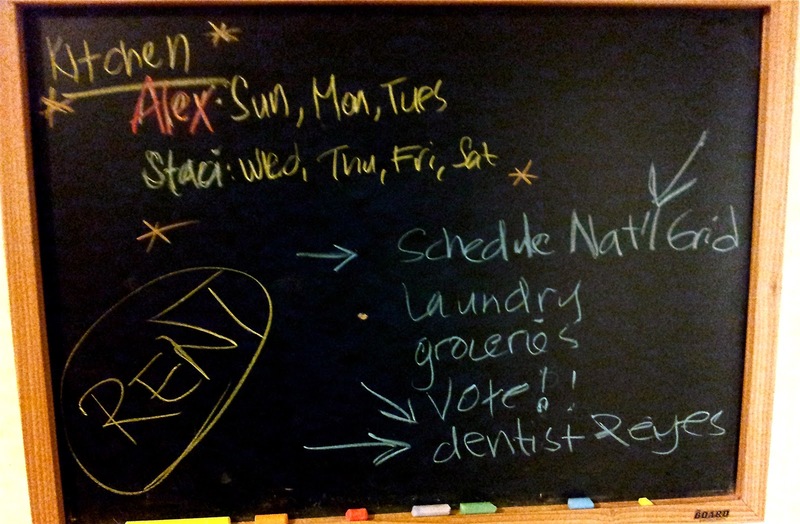 Our chalkboard is used for organizing, note writing, etc. Now it also shows the kitchen cleaning duties for each day. In more than one colored chalk because that means it’s fun! Of course, before I took to scribbling my clean dictatorship about the house, I asked Alex’s opinion. He, in typical dirty boy fashion, nodded and mumbled something inaudibly. This is where a good wife would probably infer something empathetic, but I inferred reluctant guilt at being a dirty boy and pranced into chore assignment with gusto. Is it because my handwriting is so terrible? So far, Alex has not adhered to the rules of my game. Apparently imposing OCD onto another by rules of daily chores is not effective? I have tried to give him a couple days leeway but I cannot bring myself to ignore a dirty kitchen for very long…it truly makes me angry. How do other couples solve this? To be an organized graduate student and keep a schedule of early shifts at Starbucks, afternoon classes and evening homework, organization must exist, right? Where is that elusive balance of happy home and clean home? Perhaps I need a boy’s opinion. A tidy boy’s opinion? Or at least some tips on that reverse psychology, I’m getting desperate here.